. :: Ελληνικό Εθνικό Τμήμα | Hellenic National Section ::. M.E.S.K. ( Educational & Cultural Society of Kyparissia) was founded in 1979. It has been a very active society mainly in the field of traditional dances for over thirty years. All the Greek traditional dances date back to antiquity. The majority of them are circular dances whose origin has to do with the history, customs, climate, terrain of each region and express all kinds of feelings ,such as happiness, sadness, nostalgia an love. M.E.S.K., also successfully organizes lectures, seminars, book-presentations etc. The Cultural and Educational Society of Kyparissia (M.E.S.K.) in conjunction with the Municipality of TRIFILIA are organizing an international annual folk dance festival,early in September, and are inviting folk dance groups both from abroad and from other parts of Greece , to participate and give performances in exchange conditions. So far, we have hosted international dance groups from Latvia, Lithuania, Serbia , Georgia, Turkey, Montenegro, Russia(Siberia), Romania Slovakia ,Portugal,Cyprus,Bulgaria,Moldova. 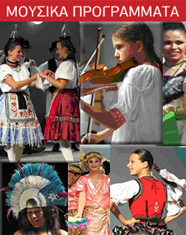 Besides that, our folk dance group, M.E.S.K., has successfully participated in many international festivals, such as those in Turkey, Bulgaria, Latvia, Lithuania, Spain , China(SANGHAI World Expo2010)Romania, Portugal and Ukraine . M.E.S.K. is a member of CID, (International Council of Dance) and CIOFF®, since November 2012) and also has performed on some TV programmes. It comprises people between 16 and 55years old. Kyparissia dates back to the Mycenaean times ,(one of the 9 cities in Homeric Nestor’s kingdom), is a picturesque seaside resort in the region of the Peloponnese, in the southwestern part of Greece, close to Ancient Olympia where the Olympic Games were born. Many nations ,such as Romans, Franks, Venetians, Ottomans wanted to conquer Kyparissia. The only mark they left back is the scenic castle on the hill of the upper town. Today the visitor is possible to: admire the traditional architecture mostly at the upper town(stone made houses, cobbled streets), go swimming and fishing, explore the olive tree groves, the vineyards, the land that produces vegetables, fruit and watermelon which is exported all over the world. The sunset of Kyparissia is one of the top sunsets in the world. © 2013 Ελληνικό Εθνικό Τμήμα C I O F F ® - Hellenic National Section C I O F F ®. All rights reserved.